Reprinted with permission from the Tar Heel Junior Historian. Fall 2004. African Americans in North Carolina have fought for equality since their earliest arrival in the state. They have protested quietly and publicly as individuals, in groups, and through organizations. The fight for civil rights developed locally and later became part of the national struggle for equality. Before the Civil War, free blacks fought for equality when they purchased themselves and loved ones from slave owners, as well as when they purchased property and lived self-sufficient lives, working and raising their families. Free blacks of means reached for equality when they voted. Enslaved blacks struggled for equality when they formed their own community within slave housing and developed their own identity separate from that created for them by the slave owner. They also participated in open forms of resistance, such as running away, destroying crops, and joining in slave rebellions. The Reconstruction period (1865–1877) witnessed the affirmation on paper of the rights of African Americans, many of them newly freed from slavery in the South. Three amendments to the United States Constitution declared their rights as American citizens. The Thirteenth Amendment (1865) abolished slavery and involuntary servitude. The Fourteenth Amendment (1868) recognized blacks as citizens and outlined basic rights. The Fifteenth Amendment (1870) granted African American men the right to vote. When they gained the right to vote, African American men voted Republican, which was the party of Abraham Lincoln (the president who had freed the slaves in the Confederate states during the Civil War). These amendments, along with several United States Supreme Court decisions, gave African Americans legal ground on which to stand in fighting for their civil rights. But even as their rights were affirmed, African Americans faced increasing restrictions on their movements and actions, and limitations were placed on opportunities for them. During Reconstruction and through the end of the nineteenth century, African American men were elected to numerous North Carolina offices. They served on local school boards, as sheriffs, as magistrates, and as representatives to the state legislature. In addition, they were appointed to a number of political posts. Four were elected to the United States House of Representatives. George H. White was the last African American to serve in the House of Representatives (1898–1901) in this period. When white Democrats, who generally opposed equal rights for nonwhites, gained control of the North Carolina General Assembly in 1872, African Americans found themselves facing removal from public offices and an end to the progress they had been making in the state. In the 1872 campaign, race was used as a tactic to divide voters. Black men who voted continued to vote Republican. Threats, intimidation, and violence were used to keep them from the polls. Democrats charged that Radical Reconstruction, controlled by Republicans in Congress, had threatened the autonomy of North Carolina. There were allegations that blacks had dominated state government, and that “white supremacy” was necessary in order to protect the interests of whites. In 1875 a state constitutional amendment established separate schools for black and white children. Blacks reentered politics and elective office when the Populist Party joined with African Americans and Republicans to dominate state government briefly from 1894 to 1898. In North Carolina the combination of Populists and Republicans became known as Fusion. White Fusionists—Populists and Republicans—needed black votes in order to win elections but were not always in support of black officeholding, and they sometimes worked with white Democrats to undermine African American voters. The reentry of African Americans into politics greatly concerned white Democrats. The Democratic Party used the state election of 1898 to further divide North Carolina on the basis of race in order to regain political power. Furnifold Simmons, chairman of the Democratic Party, ran a racist campaign in the pursuit of power. His tactics worked, and the Democrats regained control of the General Assembly and the governor’s office. For African Americans, the outcome of this election was increased racial violence. For example, during the 1898 Wilmington race riot, armed white men burned black businesses and forced a number of African American leaders out of the city. According to records, eleven blacks were killed and twenty-five were wounded, and three white men were killed in the riot. Next, North Carolina followed the lead of other southern states in passing a series of laws that segregated, or separated, African Americans from whites. The 1896 United States Supreme Court case Plessy v. Ferguson, known as the separate-but-equal case, had set the stage for the passage of segregation laws. African Americans were limited first by custom and then by law in where they could live, where their children could go to school, and which public places they could enter and use. Racial etiquette required an intricate array of “dos” and “don’ts,” which could differ from one locale to the next. In 1900, North Carolina, modeling the actions of other southern states, passed a suffrage amendment to the state constitution that prevented most African Americans from voting. The foundation of the modern phase of the Civil Rights movement was established in the “Jim Crow” era, which began in 1896 with the separate-but-equal case. Jim Crow was a stereotypical, or caricatured, black man in a song-and-dance show of the time. The term Jim Crow era refers to a period in American history in which African Americans were segregated by law regarding where they could live, attend school, and use public places. Blacks fought against segregation and discrimination, and the development of their protests in North Carolina and throughout the South began at the local level. North Carolina set up a system of segregated education that ranged from elementary school through the university level. African Americans, many of whom were poor, understood that a better life was built on a foundation of better education. They also understood that segregated education helped to maintain a separate society. African Americans started private academies to educate their children and collaborated with private foundations, such as the Rosenwald Fund, to establish schools. There were several schools for undergraduate higher education for African Americans in the state: St. Augustine’s College, Shaw University, and the State Normal and Training School for blacks (now Elizabeth City State University), among others. However, no graduate or professional schools for African Americans existed in North Carolina. Beginning in the 1930s, African Americans fought a series of court cases to win admission to graduate and professional schools at white universities. One of the first cases was brought by Thomas Hocutt (1933), who sought admission to the school of pharmacy at the University of North Carolina. Hocutt’s case was lost on a technicality. But the state did agree to allocate money for graduate programs at African American institutions such as the North Carolina College for Negroes (now NCCU) in Durham and North Carolina A&T College in Greensboro. Not until the early 1950s did African Americans gain admission to graduate and professional programs at UNC. During the Great Depression in the 1930s, African Americans in North Carolina liked what they heard from Democratic president Franklin D. Roosevelt. Because of his New Deal policies (the New Deal was not geared specifically toward blacks, but they were included on a segregated basis), and the actions of the national Republican Party—it had abandoned any fight for equality—blacks began to look to the national Democratic Party as a means to advance the cause of civil rights. African Americans were also reacting to the white backlash against their desires for equality after World War I, and to increasing racial violence by white supremacist groups such as the Ku Klux Klan. By the presidential election of 1936, the majority of African American voters had shifted their vote from the Republican Party to the Democratic Party. World War II opened a window of opportunity to push the fight for civil rights to a national level. Blacks raised this question: If America could fight to defend democracy in Europe, why couldn’t it fight to defend democracy at home? African Americans vowed to fight a “Double V” campaign—victory over totalitarianism abroad, and victory over racism at home. From this point, the pace of the struggle for civil rights quickened, and the national mood was becoming more receptive. The composition of the United States Supreme Court had shifted from conservative to liberal under Franklin D. Roosevelt. After World War II, America assumed a greater role in foreign affairs. That international role, combined with technological improvements in broadcasting, such as the invention of television; a growing African American middle class; and a national civil rights organization (the NAACP—National Association for the Advancement of Colored People), gave African Americans greater tools with which to fight for civil rights. Civil rights leaders also used a tactic called nonviolent civil disobedience to work for change. In the 1930s African American ministers boycotted a ceremony to dedicate the War Memorial Auditorium in Raleigh (because they had to sit in the balcony), and African Americans in Greensboro carried out a boycott of local theaters (to protest the absence of racially balanced movies). Kelly Miller Alexander Sr. reorganized the Charlotte chapter of the NAACP in 1940 and then worked to build the organization throughout the state. Also during the 1940s, the NAACP assisted in organizing boycotts to protest inferior segregated education. Students from the North Carolina College for Negroes picketed in the state capital to demand improvements at the school. Major civil rights organizations such as the NAACP, SCLC (Southern Christian Leadership Conference), SNCC (Student Nonviolent Coordinating Committee), and CORE (Congress of Racial Equality) played an important role in the struggle for civil rights in North Carolina. In 1947 CORE sponsored the Journey of Reconciliation, an interracial bus trip designed to test compliance with Morgan v. Virginia, a 1946 United States Supreme Court decision outlawing segregated interstate bus travel. Teams of blacks and whites left Washington, D.C., and traveled on buses through the South, stopping in Durham and Chapel Hill. Riders faced violence on their stop in Chapel Hill and were arrested in Asheville and Durham. The Journey of Reconciliation was the forerunner of the Freedom Rides of 1961. In addition, CORE led demonstrations in Chapel Hill, Durham, Greensboro, and other cities to desegregate public facilities. There were smaller movements in cities such as Wilmington, Edenton, Williamston, and others. Public facilities were finally integrated with the passage of the national Civil Rights Act of 1964. In 1954 the United States Supreme Court ruled in Brown v. Board of Education of Topeka, Kansas, that segregated public schools were unconstitutional, meaning that the schools must become integrated. But schools in North Carolina desegregated slowly. The Greensboro school system became the first in the state to comply with the Brown decision. In 1957 a few African American students were admitted to white public schools in Greensboro, Charlotte, and Winston-Salem. However, these actions did not achieve complete integration. State leaders who opposed integration devised several plans, including the Pearsall Plan, adopted by the General Assembly in 1956 in an attempt to delay desegregation by allowing all parents who opposed integration to use state funds to pay tuition for private schools. African Americans and their supporters continued to push for desegregation of public schools, however. Community action and court cases eventually helped to desegregate the schools. In Swann v. Charlotte-Mecklenburg Board of Education, a federal court ruled that busing could be used as a tool to help integrate the public schools, and the Supreme Court upheld the ruling in 1971. Yet some African Americans opposed the desegregation of public education, since they feared losing their community schools and jobs. For instance, a yearlong protest took place in Hyde County in response to a plan to close black schools and send African American students to white schools. Another key occurrence in North Carolina that became a national event and, in the process, helped to propel the Civil Rights movement forward was the Greensboro sit-ins. On February 1, 1960, thousands of college students were brought into the movement when four African American freshmen from North Carolina A&T College in Greensboro entered a downtown Woolworth store, made some purchases, and sat down at the lunch counter and requested service. They were denied service because they were not white, but the students refused to leave. They remained until the store closed, and they returned the next day with more students. The cause gained momentum. Sit-ins quickly spread to major cities across North Carolina and then throughout the South, helping to bring about the desegregation of lunch counters and other public facilities. Ella J. Baker, a graduate of Shaw University in Raleigh and a field secretary for the NAACP, called a meeting at Shaw University in April 1960. Baker believed that black college students should have their own civil rights organization. She and the students founded the Student Nonviolent Coordinating Committee (SNCC), and they traveled across the South to work in local communities coordinating civil rights activities to end segregation and discrimination, and registering African Americans to vote. Golden Frinks, who became a field secretary for the Southern Christian Leadership Conference, planned, organized, and led marches primarily in eastern North Carolina that addressed issues such as desegregation of public schools, equal access to city services, integration of public facilities, better housing, and the right to vote. The Twenty-fourth Amendment to the United States Constitution in 1964 outlawed the poll tax, which was a fee for voting. The amendment, along with the national Voting Rights Act of 1965, led to an increase in the number of African Americans registered to vote and in the election of African Americans to local and statewide offices. Additional legislation passed by Congress in the 1960s helped to remove other legal barriers to equality. The struggle for civil rights in North Carolina included individuals, church and civic groups, national civil rights organizations, community leaders, and others. The many factions did not always agree on which issues were most important or on the methods to use to achieve their goals. By the late 1960s, a rupture, or break, became evident between the older, more established civil rights organizations and the newer organizations and their younger participants. These divisions would remain. But the actions of all of the organizations eventually spurred civil rights legislation that led to the integration of public facilities in the state. The removal of legal restrictions in housing and the access of some African Americans to higher-paying jobs have changed the makeup of many traditionally African American residential communities in inner cities. The communities no longer consist of people from all economic levels. The African Americans who could afford to left these inner-city communities. The poor residents who remain do not have important role models who could raise expectations among the young. Although the Civil Rights movement accomplished much, a great deal remains unfinished. Now, new problems exist for a new generation. At the time of this article’s publication, Dr. Flora Bryant Brown chaired the Department of History and Political Science at Elizabeth City State University in Elizabeth City. Woolworth Lunch Counter. Located at http://www.youtube.com/watch?v=Xbbcjn4d1cE. Accessed February 27, 2012. CBS Newsonline, The Legacy of the Greensboro Four. Located at http://www.youtube.com/watch?v=-Rmjt0kJF0A. Accessed February 27, 2012. Southern Historical, Oral History Interview with Igal Roodenko, participant in 1947 Journey of Reconciliation. Located at http://www.youtube.com/watch?v=nGOweTnzFhQ. Accessed February 27, 2012. Hoffman, David. 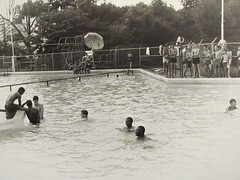 "Pullen Park Pool, August 7, 1962." Photo currently part of an exhibit at the Raleigh City Museum, Raleigh, North Carolina. Located at http://www.flickr.com/photos/universalpops/6814610463/. Accessed February 27, 2012. Blacks are still fighting against racial discrimination and injustice here in North Carolina. The Sheriff in Guilford County, Sheriff BJ Barnes has not hired any black males, "off the street" (meaning without BLET Certification) in 20 years and has one hired one black female, "off the street" in 20 years but he has hired hundreds of white officers (mostly males) during his tenure. He was elected Sheriff in 1994 and recently he has almost a dozen pending EEOC complaints now that its election year and officers are gaining the courage to start filing complaints. He has also never promoted any black officers to the rank of Sergeant or above on patrol but instead parades around his black supervisors in detention, but fails to tell the public that none of them are sworn. To make matter worse, the local newspapers and media refuses to report on this because of the power he has gained while being in office. Greensboro, North Carolina is the home of Woolworth's Sit-In Movement in the 1960's and the Klu Klux Klan Shooting in past history; yet, in a time of Ferguson, MIssouri we are still fighting against racial injustice, oppression, and racial inequality.